Taste test: These are OK barbecue chips. There's no heat in the taste, and the taste is very mild, but if you can grab one of the darker chips with more seasoning on it, you get a bit more barbecue taste. There's just the slightest lingering aftertaste. 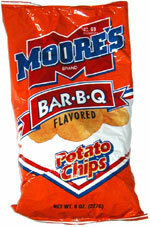 Moore's managed to pack quite a few fairly large, unbroken chips into this bag. Smell test: Good, mild barbecue aroma. This snack was discovered by Keith and Melissa at Dollar Tree. Review published .